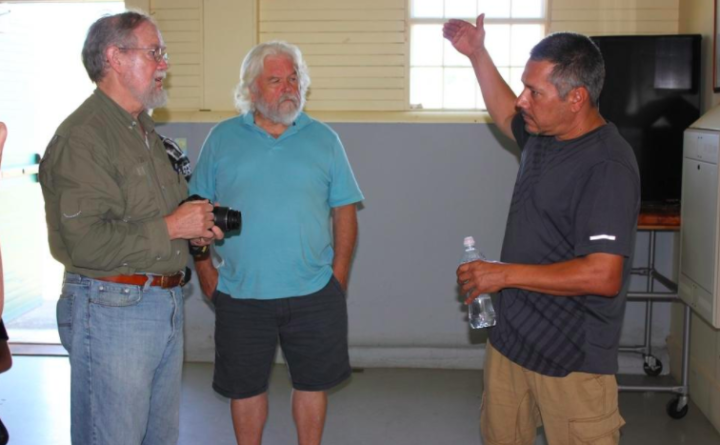 Chris Sockalexis, historic preservation officer for the Penobscot Nation, speaks with guests after his talk, "12,000 Years in Maine," in Wells recently. WELLS, Maine — History books show that Maine was settled by Europeans the early 1600s, but the state’s indigenous people called Maine home for thousands of years before that. Wells Reserve at Laudholm recently hosted Chris Sockalexis, the historic preservation officer for the Penobscot Nation, who spent the day introducing people to the long history of the indigenous people of Maine. Sockalexis said environmental changes, like sea level rise, along with modern day infrastructure projects are threatening the historic sites of these ancient civilizations. Indian burial sites are often jeopardized during road and sewer projects in Maine, and sea level rise is causing the erosion of artifacts and bedrock carvings called petroglyphs that are several thousands of years old. In his presentation entitled “12,000 years in Maine” Sockalexis talked of vibrant indigenous tribes that roamed the land, moving with the herd and advancing in their discoveries, tools, hunting, fishing and agriculture over thousands of years. Shell heaps called shell middens found along the coastline are evidence of paleolithic people dating back at least 12,000 years, Sockalexis said. There are over 2,000 shell middens of various sizes identified along the Maine coastline, but the Whaleback midden in Damariscotta is thought to be the largest along the entire East Coast. Whaleback, named for its shape, was once 30 feet deep with discarded shells and other related cultural materials that help anthropologists like Sockalexis paint a picture of Maine’s first inhabitants, and the life they led thousands of years ago. These shell middens provide evidence of human activity including primitive stone and bone tools, and housing structures, he said. The calcium carbonate from the shell middens in the coastal settlements helps to preserve the artifacts better than that of more alkaline soil found inland in Maine. He said scientists from the University of Maine are working to preserve what’s left as best they can. “Every time I go out to one of these sites, I take a million pictures to see how they are eroding. I’ve been going there for 30 years,” he said. The shell middens, primitive villages and burial sites are largely discovered unintentionally, Sockalexis said. Researchers rarely just go out to dig. They’re discovered when roads are widened, buildings are built and sewer systems are installed or repaired. Researchers are walking a delicate tightrope between discovery and sanctity, Sockalexis said. Some of the burial sites were excavated by archaeologists in the early 1900s, and the remains sent to Harvard University for research. Tribal leaders in Maine, including Sockalexis have been pressuring Harvard for the past several years to return the remains to the tribal nation. Some of the remains that were found are those of children. “We want our ancestors back where they should be,” he said. One of the artifacts on display during "12,000 Years in Maine," a talk by Penobscot historic preservation officer Chris Sockalexis given in Wells recently. The number of indigenous archaeologists like Sockalexis is growing across the country and their research and tribal histories are becoming a vital part of the scientific discovery picture. “We have indigenous archaeologists from across the country working together. We have archaeologists from the Smithsonian saying give them back their ancestors. We’re hoping Harvard will work with us to return them,” he said. Sockalexis said there are five or six burial complexes spanning 5,000 years where the intensive use of red ochre is evidence of the Red Paint People, who came before the American Indian Tribes we know today. Sockalexis said that while these discoveries are fascinating to researchers, they want to leave them undisturbed whenever possible. Sockalexis also spoke of the tools that were fashioned out of both bone and stone that ancient tribal people used to hunt and fish. Spearheads and primitive knives have been found all over the state, and the shape varies by region and the period. Large spear heads became smaller through time, leading toward the invention of the bow and arrow. Bone tools were used more in later periods because they could be fashioned with the bones left behind after a meal. Moose leg bones were carved into harpoons for hunting walrus, porpoise and seals. One of the most interesting finds with tool artifacts, are the patterns carved into them, indicating a marking from a certain tribe, and those markings remain identical through thousands of years. 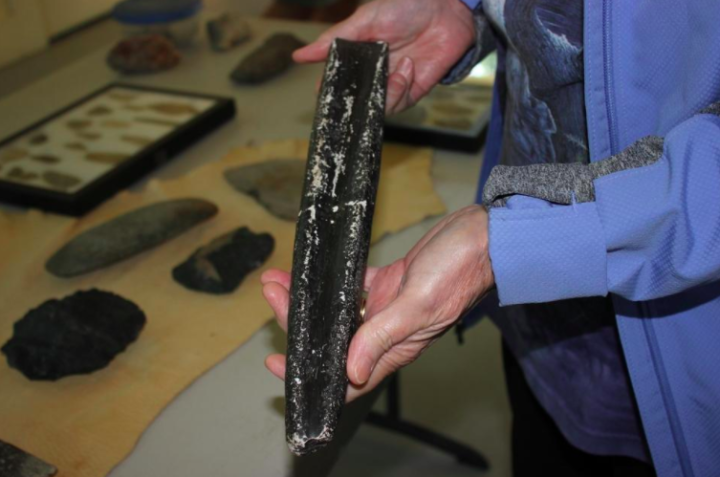 “We found a dagger and a comb with a 3,000 year difference, and the design is exactly the same,” Sockalexis said. These finds are what is driving his current research, trying to prove cultural continuity through time. Sockalexis followed his lecture with a demonstration of flint knapping, the ancient art of making stone tools, along with a session on tribal drumming and storytelling. For more information on programs at Wells Reserve at Laudholm visit www.wellsreserve.org.